Summer is here, and for many of us that means one very important thing: THE BEACH. The beach is where we relax, rollick, get sun-burnt, and enjoy light reads. I’ve perused my fair share of tabloids over past summer months, but these days, I have a new quick-read obsession: zines. All the zines! Well, all the girl power zines. The zine world is still alive and very well, even though it’s been a couple decades (we’re getting so old…) since the Riot Grrrl movement blew the lid off of the DIY feminist art movement. Over the last several months, I have scoured the internet (and by internet I mean Etsy) for the best in what’s new with feminist zines, and I am happy to be able to report back some killer recommendations. Instead of reaching for Us Weekly or god forbid Cosmo for our summer reading, we can support feminist artists and writers while simultaneously being entertained and even learning a thing or two. This is perhaps my all-time favorite zine. Brought to us by the wonderful Janelle Silver, this adorable little creation is packed full of amazing ideas, activities, recipes, and other goodies all centered on ways to love yourself. What could be better? The uplifting and super-cute illustrations accompany serious insights about why it’s important to care for ourselves. I have never seen such a fun and honest way to approach self-care. The best parts: stickers you can color yourself and tea recipes for different moods. Check out this and other works from Janelle at www.janelle-silver.com, because you are worth it! I love this zine because it exclusively discusses the experience of young Navajo women. The Native perspective is rarely heard in mainstream feminist discourse, and this zine is a great way for all of us to educate ourselves about this particularly margianalized intersection. 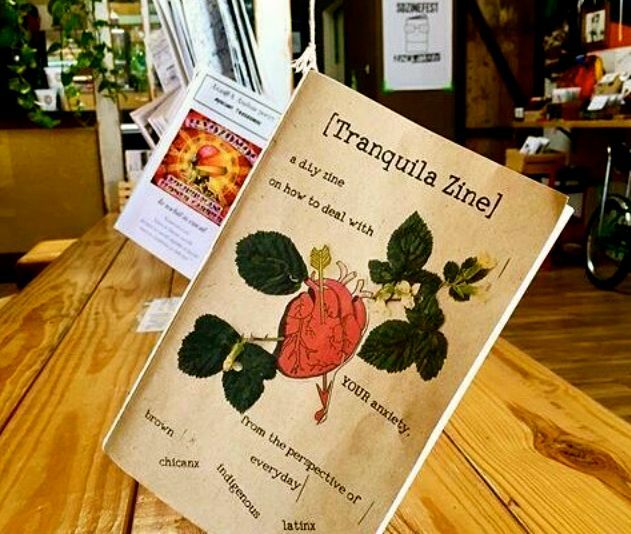 Co-writers Melanie Fey and Amber McCrarty created this zine in order to make a space for Navajo women to contribute to the feminist dialogue and feel at home in various counter-cultures. Based on the awesome content of their zine, I would definitely say they are succeeding. In particular you will want to check out the letter that Melanie wrote to her Governor about the use of Native mascots in public schools. If you are a Native woman who wants to contribute to this zine, you can get in touch with the creators at NAfeministmusings@gmail.com. This is a great comic for when you want to crack up while also giving a little side-eye to stereotypes about lesbians. OMG Lesbians! is Greek artist Smar’s exploration of the ridiculous ogling and leering that lesbians are frequently subjected to when they express any affection in public (the comic includes a lot of honking and whistling). She also humorously confronts some stereotypes that come from within the lesbian community, as well as the nutty myths that persist about gay women. My favorite quip is from a page about lesbian myths. Myth: lesbianism is contagious. Lesbian’s response: Sadly, no… You can see more from Smar at SmarMakesComics.tumblr.com. You won’t regret it. The importance of this zine can’t be understated. Created by the artist and writer’s collective Underground Sketchbook, Black Women Matter uses portraits, quotes and thoughtful biographies to honor and remember Black women who have been killed by law enforcement. The zine is heartbreaking in that it details tragedies many of us have never heard of before, but it is also very empowering to take the opportunity to commemorate these women. This zine is critical reading for anyone involved with, interested in, or following the Black Lives Matter Movement. I would encourage everyone to explore more of the social justice-based art created by Underground Sketchbook at undergroundsketchbook.tumblr.com. As someone who struggles with anxiety, this comic really resonated with me. Artist Stacey Bru portrays her anxiety in a way that so many of us experience it: as an annoying little creature that incessantly nags us with insecurity, self-doubt, and angst. Stacey also shows readers that it’s possible to deal with anxiety in healthy ways (see: Intro to Self-Care!) so that it does not control our lives. This is a really cathartic zine to read if you experience anxiety, and a great learning opportunity if you have any sort of relationship with an anxious person. You can see what else Stacey is up to on Twitter at @staceybru. So there it is! I am always fiending for more zines, so if you have a cool idea for a comic, informational series, or DIY art book, go ahead and make one! Chances are I will end up being one of your customers.